I have the same problem exactly the same drive side same Chorus model and exactly the same type of break ! Camapgnolo is keeping quiet about it it seems ! 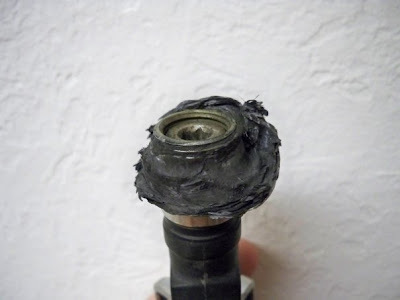 I just had my Campy Chorus fail the same way, right hand crank arm, the pedal eye came loose after a short stand going up hill I heard a very unusual creak,sat down and felt like the right pedal had come loose. 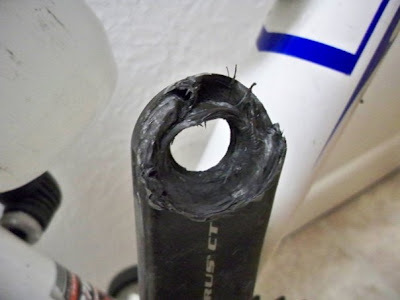 The insert inside the carbon fiber has pulled half out of the crank arm. I have had to go back to a old alloy campy set for now. This is P.S!! I am not that strong a rider. Ditto with me too. Glue broke and the threaded metal pedal insert failed during the Snelling Road Race in central CaL this year. Most annoying. How much body weight be applied to these cranks that defected? Nothing heard about Record c-f? 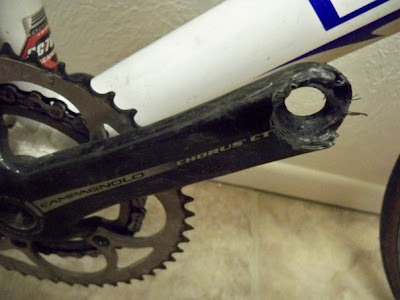 What about those whom have put scrapes on >aluminum< Record double chainring crankset? ?